Why should we hold out any hope for greater equality when the very richest people in the world are taking more and more? Pessimistic reactions are commonplace. But there is often great pessimism just at the point when a great injustice becomes apparent – when it becomes widely accepted that it is an injustice and people start to correct it. 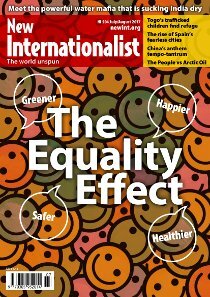 This edition of New Internationalist, edited by Danny Dorling, looks at the arguments for more equality and why they make sense. The contents of this magazine will appear here throughout the month.